IT outsourcing is a big player within the technology industry. Despite various risks and challenges that come with the endeavor, companies continue to apply the outsourcing business model to improve their processes and maximize their investments. Disaster recovery is the most outsourced practice due to its cost-effectiveness, together with the improving cloud infrastructure which enhances the overall task. However, improved technologies also requires time to train your team with handling infrastructure as well as installation costs. Which is why outsourcing comes into mind in order to get the job done right. 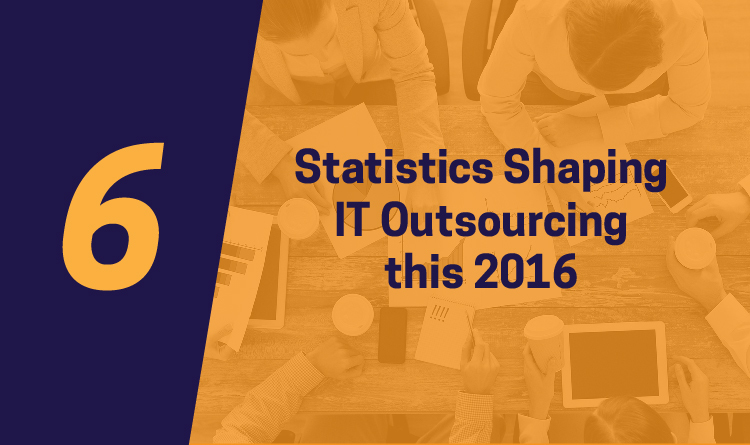 The recent growth of SaaS practices in the industry had led it to become one of the most frequently and fastest outsourced work at present. The growing regard for cloud-based applications had resulted to companies to outsource most of their IT work in order to reduce costs and leverage the current trend of SaaS and cloud applications to the fullest. However, even though cloud applications are soaring, security, compliance, and data risks are the main hindrances for companies to not switch to the cloud. The healthcare industry receives massive amounts of data that needs to be secured at all times, thus, there’s a growing need for a strong IT infrastructure to protect confidential accounts. Through this, the healthcare outsourcing industry is estimated to escalate around 47 billion US dollars come 2017. IT outsourcing plays a huge role in data safekeeping which is why healthcare companies should include outsourcing for their business agenda. It has been proven that outsourcing is one of the best practices to pursue if you’re focused on reducing costs with maximum quality results. It was stated in the study that the rationale for IT outsourcing in the next years to come will lean more on cost savings (26%), quality improvement (21%), skills access (19%), financial flexibility and market time (11%). Outsourcing providers do not just contribute to cost reductions. In fact, if you’re looking for tech innovation, outsourcing will guarantee your business’ needs for it. In fact, IT outsourcing also generates various employment and skills opportunities both for the providers and clients. Just when you think that outsourcing won’t do your business any good, service providers continue to prove it wrong by performing with excellence for every outsourced task. By exposing your business to other perspectives and skills, you can be sure that your business will be in good hands. While IT outsourcing is no longer a new practice, constant technological advances and trends can affect the way it is done and your business will be taken within the flow of its changes. Take note of these statistics to make your business run better than before. This is something to be excited about not only because of the fact that there will be more businesses who would set up a global in-house center in other countries, but also due to the benefits that it will bring on the plate for all the citizens starting with the increase of job opportunities, decrease of unemployment rate, and the ongoing advancement of technologies that continually help the well-being of the people.